This past weekend of Jan 28, the Chinese new year began. 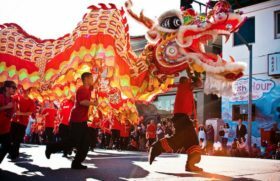 In celebration of the year of the rooster, there will be a festival and parade in Chinatown on Feb 4. This is one of the oldest Chinese traditions in Los Angeles. The 118th annual Chinese New Year parade and festival will be located in Downtown Chinatown. There will be several acts varying from kung fu demonstrations to traditional music acts. The East meets the West as old meets new with food trucks, ping pong for playing, and several other entertainments. There will be kid friendly activities such as face painting, storytelling, and origami. The year may be of the rooster, but the main attraction will be the Golden Dragon Parade beginning at 1 pm and ending at 3 pm. The Golden Dragon Parade has expanded over the years to include almost two dozen flotes, multiple marching bands, government officials, entertainers etc. The festival and parade are also a time when ancestors are fondly remembered and families give thanks for their blessings. Overall, parade and festival attendees are guaranteed to have a ton of fun.